In Computing at KS3 in England, students have to learn how images can be stored and manipulated using binary data. This can be a tough part of the curriculum to cover in the limited time available to most schools but it can also be a really exciting way of bridging the gap between the Computer Science and iMedia / IT facets of the course. In order to follow up from a series of lessons using Photoshop to create and manipulate high quality graphics, I wanted students to be able to understand how the images that they’d just created were stored on a computer. There are some excellent ‘unplugged’ resources out there where students can see how simple images can be represented by binary data but I wanted Y8 students to be able to write, edit and debug some simple python code that showed them how computers store and process images. There are two main ways that computers use binary data to represent images. 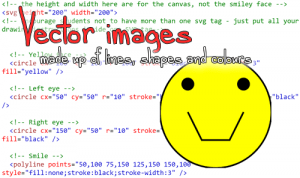 This blog post details how you can use free web based tools to get students to explore how computers can represent and manipulate both bitmap and vector images. The next page gives some activity ideas for getting students to understand how vector images work.